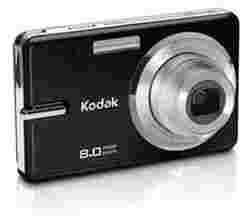 I like Kodak point-and-shoot digital cameras with their compact design, innovative features, and high megapixel sensors that are extremely easy to use right out of the box. Kodak offers four very similar cameras in recently launched M-series, and the Kodak M883 is one of them. The M-series sits in the middle of Kodak’s EasyShare range, between the entry-level C series and the higher-end V series. For more advanced shooters, despite the high megapixel sensor, face detection and digital image stabilization features, the images leave a little to be desired and, at times, operation can be sluggish. My pictures were a little soft at times, but looked perfectly crisp at postcard and 6x8-inch print sizes which, I suspect, will do for the majority of consumers. So this won’t be an issue, unless you’re making jumbo-sized prints. Colour reproduction was okay, with good saturation. The shutter lag means you will have to anticipate the right moment in a dynamic frame and press the shutter accordingly. Focusing speeds were, however, below par, with the camera taking some time to lock in, especially in low-light conditions. Features-wise, the M883 is fairly standard for a mid-range compact model. It features a 38-114mm zoom range, a face-detect focus mode, as well as ISO and white balance presets, with the “auto" setting doing a good job. In fact, the auto white balance did a far better job at removing the ghastly greenish tint of the photos shot under the fluorescent lights of the office than the recommended “fluorescent" white balance setting. ISO speeds extend up to 3200, but I wouldn’t recommend shooting above ISO 400 unless you’re a fan of a little graininess. There is digital image stabilization as opposed to the far superior optical image stabilization, and is of limited use. A great feature is the Panorama mode, which auto-stitches three pictures clicked in sequence for a super-wide frame. Video capture is at a TV-quality 30 fps at 640 x 480 pixels. The battery is rated for 300 shots, which is better than comparable cameras in the M883’s class.